Today I finished the last of the three UFO's I chose to complete before I could start a new quilt. I made the pieced star block into another miniature wallhanging to join my first two. The little Christmas stockings still need some rusty bells attatched to them. The little bin is already in use! So what is the new quilt I am about to start. 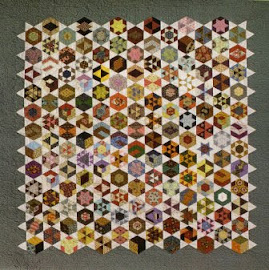 If you go to Legend and Lace's web site you will see a Block of the Month- the "Rose Garden". I have picked my fabrics and will start cutting out pieces today so I can take them to my next HAG'S (Hand Applique Girls) get together. The fabrics are quite pretty and muted, I love trying new colour schemes. These will be quite pretty together. Three finishes - that is admirable. The little bin looks like a temping project. I like your fabric choices - a very soft pallet. Love the star block Penny. The blue, pink and brown are "so Penny"!! Is there a pattern for the little bin? It's been haunting me since my last visit to your blog. Checked Wendy's site and didn't find a pattern. Let me know, Thanks!! Love the fabric colors! I'm going to go and check that line out! Thanks for all of your inspiration. Happy Quilting!